PLEASE use these or others! Like many of you, I've been tuned into the Olympics 2012. We've only had 2 days of coverage and I've already heard 2 stories about athletes having malignant skin cancers. Several years ago, I started using sunblock sporadically. This year, I've been much better, and rarely miss applying before heading out for a run. One of the athletes was a biker, and the other a beach volleyball player. Like them, training for a marathon requires a lot of time out in the sun. Well, I should say, if you have become lazy, like me, and no longer do the bulk of your running predawn, you are in the sun for hours each wk. It's funny the phases we go through as runners. Several years ago, I trained so much in the early hour darkness, that I REALLY did not like running when the sun came up. To run a 5k at 8:00 am was painful, like, I was becoming a vampire. Today, I prefer NEVER starting a run before the sun is up, although occasionally that may happen. I'm lazy, and I'm totally ok with battling the heat, vs. getting out the door in the dark. This summer I've been trying different brands of sunblock with the hopes of finding a non-greasy option. The picture shows some of my current favorites. For my face, I love the Garnier. In truth, I think I purchased it because of the claim on the package - "reverses the signs of age", like age spots. Yep, out of the blue, age spots popping up overnight (in addition to the freckles, that are already in abundance). Really! I'm too young for age spots. WHATEVER! To date, I'm not seeing the age spots disappearing, but I do like the feel of this one on my face. Please make a recommendation if you've found a reasonably priced, age-spot remover. My most recent purchase is the Banana Boat Sport 50. I love this one so far. Finally, truly, a non-greasy feel. I've tried several that claim non-greasy, only to be quickly disappointed. I also like the Jergens. It has the advantage of having a toner (which I'm sure causes cancer itself) and a sunblock all in one - nice! 7 weeks until Top of Utah. The excitement is building quickly. Each week, Terri and I are building our endurance and speed, and getting in some excellent training together. Last week was a recovery week for Terri and me. I'm thinking it was smart and perfect because we both came back this week ready to train. THAT, WE DID! 800s @ 3:43 avg., in the July heat - BAM! Thurs - w/ Terri - 8.5 miles with w/u, 8 X steep hill repeats (avg. - 53 second hill) (if you are local - the last "billboard hill"- the evil one- not long, but steep), then we had 8 X 30 seconds on flat, fast, then c/d. Sat - 19.5 miles - we had a gang of runners meet to run various distances and various paces at Clyde Depot. I arrived early, and knocked out 1.5 miles before everyone else arrived. I was somewhat worried when I finished the 1.5 miles, and I'm literally already dripping sweat (fun times in the South). After the 1.5 miles, Terri, Kily, and I had 18. It was 75 degrees with crazy high humidity, at my 5:40 am start. I ended the day with a 9:30 avg pace. With the exception of the recovery week, (10:08 avg for 10 miles), most of our recent long runs have ended around 9:20 avg. My last long run, before the recovery wk. was 16 miles. With the extra mileage on Sat, (from 16, up to19.5 miles) and the extra heat/humidity, ginny was HAPPY to end with the 9:30 avg. Terri and Kily picked it up at the end, and ended with a little quicker avg. for the day. Overall, I think everyone had a solid day, despite the heat. I do love a summer group run. 57 miles running, 5 miles walking, 2 yoga classes, plyometics X 1 mile, various, sporadic weights, push-ups, etc. with a little Boot Camp added in. cuz I have a tempo run on the schedule to keep. I thought I would share this week's training for the Top of Utah Marathon that will arrive quickly, no doubt. I will run this evening with Audrey, to finish my week at 53 miles. The training is going very well. Mon - July 9th - 5 miles easy and 1 mile of lunges, skipping, squats, etc. I generally do a set followed by some recovery walking, and then start with the next set with something different. I alternate through various exercises until I have completed a mile. Basically, no rules and not structured but it's a good plyometric type workout. Tues. - 9.5 miles - Terri and i ran a hilly loop from my house. My plan called for the last 10 minutes to be at half marathon pace. We averaged 9:07 pace, with the last 10 minutes at 8:07 pace. Wed. - Missy and I have been meeting on Wednesday's to walk 5 miles, and then we both rush home and make it to yoga mid-morning. This works out well for a recovery day for me. Thurs. - 12 miles - 3 mile w/u, 8 X 800 at cruise interval pace with a 200 recovery, and then 3 X 200 with 200 recovery, followed with a 3 mile c/d. I'm using the McMillan calculator to get my cruise interval paces. I'm using my most recent, Moon Pie 10 mile race time and my goal marathon time at TOU. The Moon Pie race was in June so my thought in using this time is not only that it's my most recent race, but also because it's a "heat adjusted" time for our current heat & humidity. At the same time, I want to work toward my TOU goal times. My goal time assumes good weather so I think the times are slightly unrealistic for the current weather. The McMillan chart gives a range of times so I'm using the low end of the Moon Pie prediction times, and the high end of the TOU goal times. So I decided my goal for the Thurs workout would be 3:48 for the 800s, and between 45-50 seconds for the 200s. Terri's goal for the 800s was 3:45 so we were able to run them together. At the end of the workout we had "nailed" our times. I averaged 3:48 for the 8 X 800 and Terri ended with an average of 3:45. After the 800s, I had mentally checked-out and was preparing for the 3 mile c/d when Terri reminded me we had the 200s left. EEEEKKKK! Thankfully, we only had 3 to do, but it was hard to get back on the track for speed when I had mentally prepared for the cool down run. I averaged 48 seconds for the 3 X 200. Terri has much more speed than I do. Not sure what she averaged but she finished each of the 200s well ahead of me. The last mile of the 3 mile c/d was challenging. We ended with an excellent workout. if you can "work up to" 10 X 800 with equal recovery time, in theory, you should be able to run the marathon at that predicted time. For example, for a 4:00 marathon, if you can work up to 10 X 800 at 4 minutes, with 4 minutes recovery, you should be able to run a 4 hour marathon. Of course, the prediction is assuming you have completed a total marathon plan including long runs, etc. I'm sure it also assumes ideal conditions on race day. My last test of Yasso's 800s was in the fall of 2010. I worked up to 10 X 800 at 3:42 avg. but then ran 3:56 at the Rocket City Marathon. I have tested the Yasso several times. I didn't look back at the earlier results, but I do think some of the earlier times were closer than this example at Rocket City. While the prediction hasn't worked for me yet, it's still a challenging and fun workout to complete. has the yasso integrated a little earlier in the program followed later by various ladder workouts, mile repeats, etc. I will update later with the Yasso workouts and results of this latest trial. 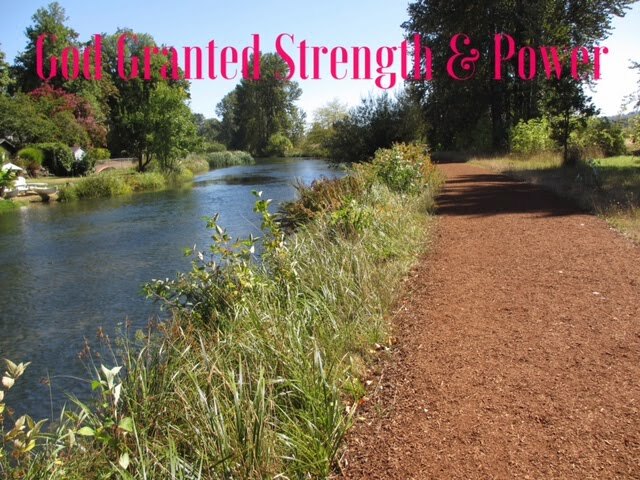 Fri - I had 6 miles EASY (should be around 9:30ish pace) planned for Fri. but a friend sent a text asking about running with her for her long run. She had 18 miles, which I couldn't do after the track workout, but I told her I would meet her for her final 6 miles. She is fast! We ended up running 6 @ 8:47 avg. which is fast for me the day after the 12 and track workout. In addition, I had 16 miles to run on Sat. for my long run. Fri. afternoon I made sure to get some EXTRA rest, and Sat. AM, I was surprised that I felt READY to run. Sat. - 16 miles - we had a small group to run the first 8 miles on the flat Longleaf, asphalt trail. Terri, Kily and I finished the last 8 miles on the hills at Canebrake (no large hills, but steady rolling hills) I averaged 9:16 for the 16, Kily and Terri both finished ahead of me, but we ran the majority of the run together. Good Times! Happy with it! Sun. - this evening I will run 5 recovery miles with Audrey. Another great week of training checked off. This completes my 7th wk of TOU training. For the upcoming week, my training plan calls for a mild recovery week with the suggestion of running the lower range of the mileage, but I'm adjusting the plan to cut the mileage, and the speed work this week. I feel it's a good time in the plan to take a "step back" week and let my body absorb some of the recent weeks of training. I hope your summer training is going well and that you have adjusted to the heat. "We’re bringing back the #RWRunStreak to help us—and you—bridge the gap (between reaching your spring goals and starting your fall training) and maintain spring fitness. Run at least one mile per day, every day, starting on Memorial Day (Monday, 5/28) and ending on Independence Day (Wednesday, 7/4). 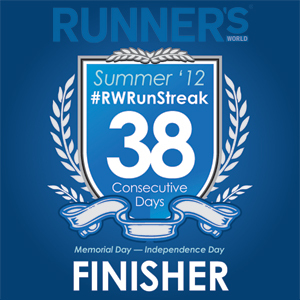 That’s 38 consecutive days of running." If you haven't been following Happy Trails blog, you've been missing years of some of the best trail running pics in blog world. I'm sad to say, they live in the CO area that has been affected by the fires. I ask that you pray their safety, and safety for their home, and their neighbors and friends in the region. As for my running, this has been a tough week. As with a large majority of the country, this week the temps have taken a large jump with humidity on the rise in the South. We have enjoyed a decent spring, but all of the sudden this week, the heat "hit hard." Tues., Terri and I ran 4 X 90 second hill repeats, and 8 X 30 second strides. I actually made the call to adjust my plan for the day. My schedule called for 8 X 90 second hill repeats, but during the workout, it became clear, on this day, that was not going to happen. We ended the day with a great workout and a total of 7.5 miles. Thurs. was my next hard day. The plan was 3 miles w/u, 15 X 30 seconds w/ 1 min recovery, and c/d, followed by 1 mile walk. I was able to finish the workout, but it was a tough day. Upon my return home, I could feel the impact of the heat and humidity. I decided an ice bath was needed. Knowing that I had 15 miles on Sat., I wanted to enhance my chance of recovery - ice does that for ME. I know the reports on the benefits of icing go back & forth. One article says it's beneficial, the next says no, but for me, the proof is in the feeling of my legs and body, post ice bath. For me, the results are real, like night and day difference, in recovery. So, I had 2 HARD workouts, with the 2nd making me think hard about the training. I do this, when I have a tough workout. I start to analyze, always analyzing. What I quickly realized is that I had become lazy with my hydration. I'm typically big on hydrating often, but with the nice spring, I had become lazy in hydrating. I started stretching my watering stops to 25-30 min. That was ok with the cooler temps., but after Thurs. 's workout, I realized it's time to "get right" with my hydration and nutrition. Terri and I had planned to run 15 miles Sat. am. I rarely get nervous before a long run, but on Fri., after the two tough workouts earlier in the week, and heat indexes over 100 all week, the thought of the Sat. run was making me a little nervous. I was expecting a SUPER tough run - a gut check run - you know what I'm talking about. So Friday, during the day and evening, I hydrated REALLY well, and made sure my water, gels, and Gatorade was in order for Saturday's run. We met (Terri, Keith, Audrey, and I) to run some rolling hills. Yes, 15 miles of rolling hills and extra high heat. We will adjust to the extreme Southern heat, but this is the first longish, run with extreme high temps, this summer (another reason for the nervous feeling). Terri and I exchanged text messages on Fri. committing to adjust our pace, hydrate, and "be smart." Keith and Audrey ran some mileage with us. Terri and I hydrated with water, gel'd, and had a Gatorade stop. For the last 6-7 miles, we headed to Bent Creek, which offered the most shade. The run went much better than expected. The last few miles were really tough, but we ended the day with a much better than expected average pace. We "gutted" it out, and even picked up the pace for the last mile. We finished the run around 9:00 am and it was 84 degrees. I'm not sure what the "heat index" was, other than HIGH, HOT, and SWEATY. I feel like we will look back on this week as a heat adjustment week. For me, Tues. and Thurs. served as my little nudge (reminder) to do what I need to do to ensure the best possible run. For me, when I have proper nutrition and hydration, the majority of my training runs go as planned. When I get lazy, not so good. It typically only takes 1-2 bad runs to jolt me back into my structured way of "nutrition on the run." Yes, it's extra effort, and can be a pain to prepare/implement, but for me it's so worth the hassle to enhance the possibility of a good run. I'm not like some runners who can go out, run after run, having bad runs because of nutrition hydration problems. I can't handle "bad runs", so I try to do everything in my power to prevent one. Will I still have some, YES, but thankfully, when I take care of myself, they are rare. So now, I'm back to hydrating every 15-20 minutes through the rest of the summer. If I'm running over an hour - gels or Gatorade type drinks are a must.